Wemyss Caves Fife, Time Team at work in the Well Cave. 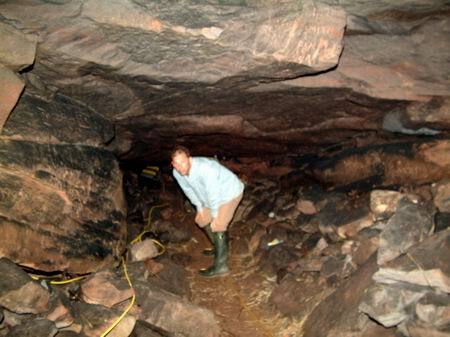 The following photographs were taken while the Time Team were excavating the Wemyss Caves. The images that follow give a flavour of the day, they record some of the activities on the day. Pictures here are exclusive to this web site. The following set of photo's were taken in the Well Cave. Above Douglas Spears is seen looking at the site of the original Well. supposed to have healing powers. Douglas discussing progress with one of his colleagues. was a tunnel with stairs running from the castle to the Well cave. It would appear from excavation that this is not the case. There would appear to be no steps linking the Castle and the Well cave. Above and below: General look at excavation on floor of Well cave. Above and below: General shots looking across the Well Cave. to allow gases to escape. One of the metal ties that had been fitted in the cave to support the roof. James Wood? These are dated 1868. Looking towards the tunnel that provides access to the cave. It is a 'crawl' on hands and knees to gain access. A look at one of the side walls. (opposite the graffiti wall pic). Douglas takes one last look back into the Well cave before leaving. Above and Below: General pics looking around the cave. These were my last photo's of the Well cave before I departed. Above and below: The entrance to the Well cave from the outside. good jeans/trousers or good shoes/boots when trying to crawl in!!! sandstone wall above the Well cave entrance. Fitting a radio mike before filming. a piece of jewellery from that time. Interested onlookers with camera's at the ready record the filming as well. The Director views the filming as it happens (wireless). Looking down on the excavation on the shore. Jonathan's cave, Filming gets under way here. I think there were three camera crews working on site. Enjoying the view out over the Forth.